Sous Vide Cooking: If you love good food, keep reading. One of the things that people all over the world truly have in common is a love and an appreciation for a well-cooked meal. Over time, people have devised many different ways of heating and preparing their food items. Some common methods include frying, grilling, baking, broiling, and barbecuing. These are by no means the only way to get the job done, however. There are other cooking methods that have been developed that, while not as widely used as some of the other techniques, can cook food to a level of taste, texture, and perfection that is unheard of using other methods. One of these world-famous cooking techniques is known as sous vide. It is widely used and endorsed by some of the most highly decorated chefs in the world, and with good reason. This article will go into some sous vide basics, as well as discussing some common types of sous vide machines, ranging from high-end to home-made machines. 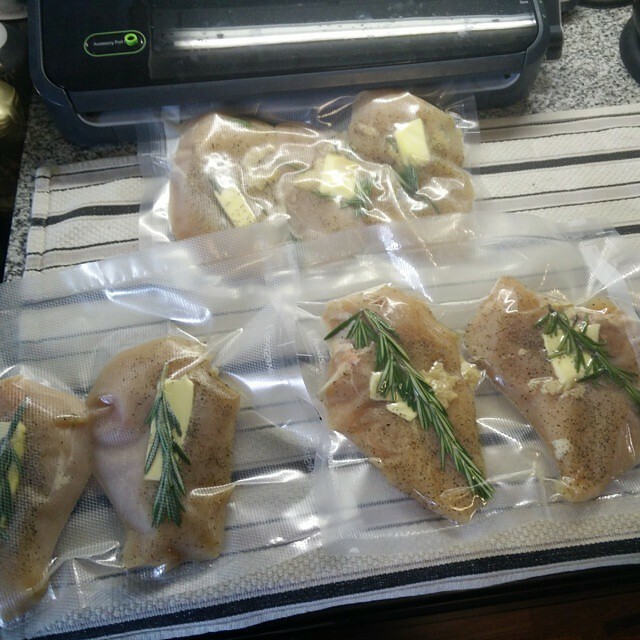 Sous vide, (which is pronounced soo-veed) is a French phrase which translates to “under vacuum.” It refers to a method of cooking food in which the food items are placed in a vacuum sealed container, usually made of some kind of plastic. Once this has been done, the bag containing the food is immersed in a bath of warm temperature controlled water. The temperatures used in sous vide cooking are typically far lower than those used in regular cooking, with ranges between 131 and 140 degrees Fahrenheit for meats, and up to 180 degrees for vegetables and other food items. This food is slow cooked at these relatively low temperatures for an extended period of time, from a few hours up to a few days. When the center portion of the food is close to the target finish temperature, it is then removed from the water. At this point, it can be eaten as is, seared or cooked a little further in some way, or in some cases stored for future consumption. This method of cooking provides a level of precision in temperature control that is unprecedented. Foods cooked using this method will be prepared to perfection every time, with the inside being properly cooked without the outside being subject to overcooking. This cooking technique was first used in the late 1700’s, after which it was re-discovered by engineers in the 1960’s. At this time, it was mainly used as a way to preserve food. The method was ushered into the big time by a famous chef named Georges Pralus, who used it to prepare dishes at the restaurant he oversaw. As word spread of the spectacular results obtained by preparing food in this manner, commercial and then personal sous vide machines gained entry to the market. WHAT ARE SOME OF THE BENEFITS OF SOUS VIDE COOKING? * Simple and easy. People who use sous vide cooking techniques can expect consistent and excellent results, with relatively little effort. * Gourmet quality food. More than any other method, sous vide cooking captures flavors that have to be tried to be believed. * Time saving. The cook simply sets the temperature and timer, places the food in the water, and comes back many hours or even days later when the food has been cooked to perfection. This creates a lot of valuable free time for sous vide machine owners. Additionally, you can cook something sous vide then immediately refrigerate it. Take it out days latter and sear/heat the item and you will have a meal in minutes instead of hours. * Adds nutritional value to the meal. The cooking container seals in all of the awesome vitamins and minerals that are commonly lost when other cooking methods are employed. * Saves money. Since the food that has been cooked sous vide is sealed inside an airtight container, it is never exposed to the oxygen in the air after is has been cooked. This means that sous vide foods that remain unopened maintain their freshness, taste, and nutritional value far longer than other foods. This translates directly into savings for the user. WHAT ARE SOME TYPES OF SOUS VIDE MACHINES? There are various kinds of sous vide machines to choose from. These devices range from cheap and extremely low tech, to absolutely cutting-edge and downright expensive. As long as you have those three elements, you can cook sous vide. How you get there depends on the amount of hassle and effort you are willing to put in. You can build your own “DIY” sous vide machine, or you can buy an applicance specifically made for sous vide cooking. Given that you can buy an extremely competent and reliable sous vide machine for $200 or less now-a-days, it makes sense to buy one. Nonetheless, we’ll cover all of the different machines that can be used. Machines range from the so-called do-it-yourself (DIY) stove top or “beer cooler” sous vide setup, to stand-alone sous vide machines, sous vide to sous vide immersion circulators that you attach to a large pot or container, such as the anova or nomiku. The beer cooler method is the easiest and lowest tech way of going about things. It involves heating the water to the desired temperature on a stove, and then using some kind of insulated container to hold the liquid. The food is then placed in the container and allowed to cook. This way of preparing food sous vide does work, but it should be noted that it is the least consistent of the methods since you are reliant on your heating element and will constantly have to work to maintain the proper temperature. Additionally, some containers may leach dangerous chemicals into the warm water. DIY Sous Vide Machine example. Getting slightly more advanced than the stove top methid, you can make your own “Frankensteined” sous vide machine. Sous vide temperature controllers are devices that use crock pots or rice cookers to heat the water to the desired temperature. The temperature controller monitors the heat levels and turns the pot on or off when needed. These tools are easy to put into use if a crock pot or rice cooker is available, and they thus offer a relatively low cost method of cooking food the sous vide way. The downside to them is that they are generally unattractive appliances, as can be seen above, and they require more effort to build and maintain than the more professional, stand-alone solutions below. Sous vide water baths are self contained units that include the temperature controller and heater and circulator. These units tend to be large in size and fairly expensive to buy but some machines offer more precision and better results than the less expensive models. Sous vide immersion circulators are basically a heating element combined with a water pump. This means that the liquid is constantly being moved around, and this translates into superior precision in terms of a constant water temperature. This in turn contributes to food that is cooked as near to perfection as possible. My Anova machine, hard at work cooking some steaks. Close up of the attachment mechanism. You can attach the Anova to a large pot or even a large bin for bigger cooking projects. Another great thing about immersion circulators is their ability to be used in a wide variety of containers. This means that the size of the portion being cooked can be tailored to the size of the container, resulting in superior results. WHAT ARE SOME OF THE MORE POPULAR SOUS VIDE MACHINES? There are many brands of sous vide machines on the market, but some of the more notable ones include the Anova Precision Cooker (read our review here), and the the Nomiku Sous Vide Immersion Circulator. They are both immersion circulators that come included with some amazing features. These two machines cost around $200.00 to $300.00, respectively, but they both do a great job of providing world-class sous vide cuisine. You can also opt for a standalone machine such as the Sous Vide Supreme Demi Water Oven. Or go the more professional route with a machine like the Fusionchef Pearl Professional Sous Vide Water Bath Cooking System. You can read more about choosing the right machine in our article dedicated to reviewing all the top sous vide machines. I hope this article about the basics of sous vide cooking was helpful and educational. Ultimately, sous vide is about making great food. The ability to control the temperature of the cooking element down to one half of a degree allows for some truly tailored cooking. This technique is powerful, not only for its precision but its ability to truly transform food. Have a cut of rough meat? Cook it for 16+ hours at a low temperature and it will turn into the softest and most velvety piece of meat you have ever tasted. Additionally, sous vide cooking is healthy. Instead of cooking with oil or butter you are cooking food in its natural juices and by immersing it in a water bath. Great food and better for you!? It really is. I hope after reading this article you are as excited as I am about sous vide cooking. Please go on to read some of our other articles about selecting the best sous vide machine, or the top sous vide cookbooks. My personal favorite machine is the Anova Sous Vide immersion circulator, due to its low price, ease-of-use and generous feature set. You can read my review of it here.